Another film I'm keeping a close eye on at the Toronto Film Festival is Ceremony. It's the feature debut of Max Winkler, son of Henry Winkler, who wrote the script and directed a cast including Michael Angarano (Forbidden Kingdom), Reece Thompson (Assassination of a High School President), Lee Pace (The Fall) & Uma Thurman. It's a comedy about two friends, one of whom falls for an older woman about to be married. Sam (Angarano) drags Marshall (Thompson) out to a beach town in hopes of breaking up the wedding, but they soon realize how out of place they are amongst the British groom and his guests. Three photos below. Ceremony has a score from Fruitbats singer Eric D. Johnson as well as other great songs on the soundtrack. 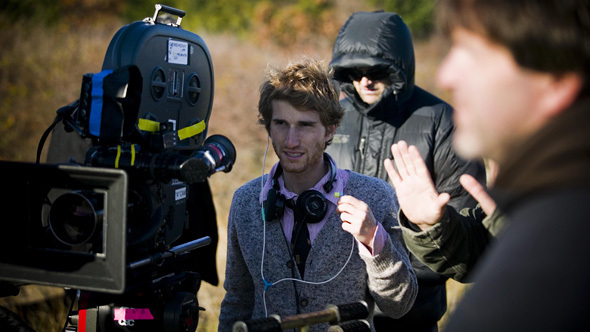 In the lower two photos, you can see Max Winkler directing various shots, while the top one is an actual still. While this could be described as a coming-of-age comedy, I talked with Max and he said it's actually more of a coming-of-age story in reverse. Essentially Angarano's character thinks and acts a lot older than he is, but over the course of the film set at this wedding, he ends up realizing he needs to be true to his own age. From what I've seen and heard, it has the potential to be a fantastic indie gem and I'm very excited to see it (check out a soundtrack listing on The Playlist). These photos probably don't do it justice either, but that's all we've got for now. Stay tuned for our review and more coming soon! Visit the official TIFF webpage for extra info. I really like Lee Pace and he was great in the Fall and A Single Man. However I really hope he isn't playing the British groom as his English accent in Miss Pettigrew Lives for a Day was terrible.